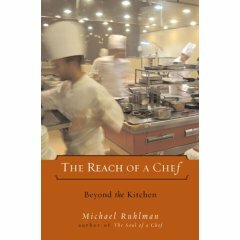 Beginning at Per Se, the newest and most expensive of Manhattan’s four-star restaurants, Ruhlman takes readers into some of America’s most illustrious—and most innovative—kitchens. Throughout his travels, he seeks new trends and phenomena, like Las Vegas’s recent elevation to the country’s food Gomorrah with the addition of Picasso and Aureole to the Strip’s already formidable selection, and returns to legendary haunts like The French Laundry, Le Bernardin, and Café Gray to see what’s changed. A dispatch from a new world where chefs are celebrities and culinary school classes are burgeoning, The Reach of a Chef looks at the state of professional cooking in the post-Child, Food Network era. In the end, an audience who loves to talk about, read about, and dine in the finest restaurants in America gets an in-the-trenches look at the professionals whose very life’s work is to feed us. I think I will wait for paperback, but it sounds good. UPDATE: Mr. Ruhlman posts in the comments below that he writes about spending time on set during the production of 30 Minute Meals. I guess I will have to buy the hardcover now (especially since I told him I would in the comments)! i spent time on her set during the production of 30 minute meals. that's what i write about. i admire ray. she's a pro. Alright, Michael, fine, I'll buy it in hardcover! Thanks for stopping by. I look forward to getting your behind the scenes perspective.